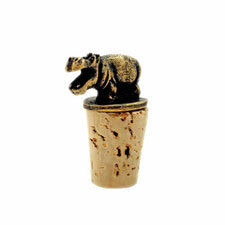 Our laughing hippo wine bottle cork is cast from zinc and electroplated with an antique brass finish. Made in Cape Town, South Africa, by a fair trade brass casting company that is one of Africa's biggest casting producers, each wine bottle cork is meticulously checked by many hands. Wonderful gift for wine enthusiasts or hippo collectors.